Up next in my literary celebratory posts is a children's book I am extremely excited about. 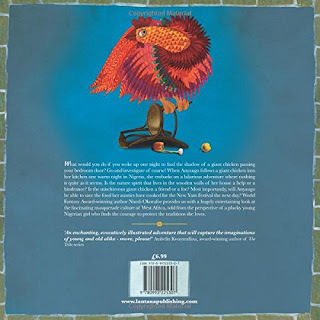 Nnedi Okorafor's, Chicken in the Kitchen, might be a picture book for children between the ages of 4 - 8, but it is an absolute joy to read - even for older readers. Published by Lantana Publishing, an independent publishing company 'committed to addressing the widespread lack of cultural diversity in children's publishing in the UK', Chicken in the Kitchen introduces the reader to an enchanting world in which there is a magical chicken, a nature spirit and a pretty courageous little girl who in the middle of the night decides to investigate after being awoken by a noise. 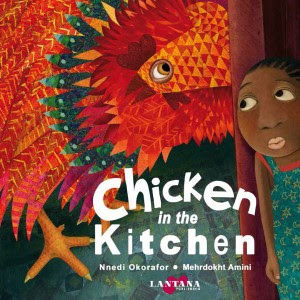 On her blog, Okorafor gives us some insights into the origin of the chicken - this is one of two stories Okorofar used to read to her then three year-old daughter who wanted her mum to 'make some [stories] up just for her'. I really love how Okorafor also explains the story as one that is 'full of nonsense, magic, mischief, culture, spirits and there's a giant dramatic chicken in it'. 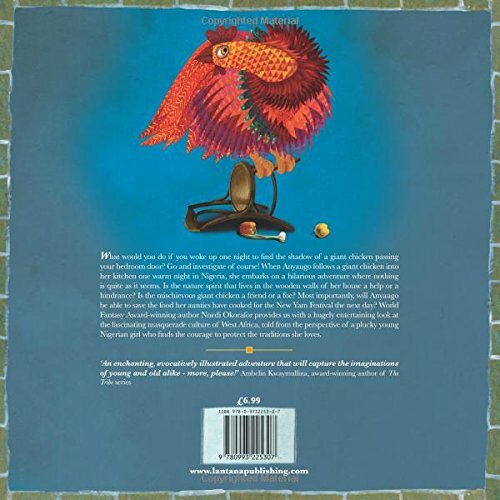 Chicken in the Kitchen works for a number of reasons - one is Okorafor's imaginative words, which truly transports you into a world of mystery and magic (I mean what more do you need for an awesome late-night adventure?). We also learn about the New Yam Festival and get introduced to masquerade culture. Another strength of this book are the breathtaking illustrations by Iranian-British illustrator, Mehrdokht Amini's, which magnificently captures this amazing late night adventure. From the shadow lurking in the night while Anyaugo lay in bed, the giant chicken in the kitchen and the chaos it was causing, to the mischievous wood wit, Amini really and truly brings Okorafor's words and characters to life in a magical way. Amini certainly has a fan here and I adore her gorgeous work. It really is wonderful to see such a superbly illustrated book for all children to enjoy ... and as I am celebrating art in Nigerian literature this month, here's a glimpse at Amini's illustrations for this delightful story. Mehrodkt Amini has worked on many children's books, and her art is so exquisite, so definitely check out the rest of Amini's work on her website. Also, Lantana Publishing's Pinterest page let's us take a look at the cover illustrations and inside pages of their picture books for children, and they are oh so gorgeous! When I was studying, one of my favorite subject is literature. It is interesting and fun. Hello! I really enjoyed reading about this beautiful picture book... I will definitely get it for my daughter! One thng though: the link to the website of the Publisher is broken, could you fix it? It really is a beautiful book. And thanks so much, have updated the publisher's link.